Version 2 of the Emojione set is no longer supported by EmojiOne Inc. (nor Ranks.com). Version 3 has a slightly different design and new, more restrictive licensing terms. Access to high-resolution bitmaps and vector sources is now restricted to paying customers. Some people prefer the flat cartoon design and the FOSS license with actual access to the SVG sources. Therefore, we created a fork of Emojione version 2.2.7 as Emojitwo with initial version 2.3. The artwork of this second generation of the web’s first complete open source emoji set is and will stay 100% free. Emojitwo is restricted to the artwork, i.e. image files. SVG is its native format. Everything else is derived from that. As of its initial release in April 2017, Emojitwo did not contain any additional artwork. Unicode 9 beta emojis Rifle and Modern Pentathlon have been resurrected: U+1F946 🥆, U+1F93B 🤻. Flag for deprecated region code SU: U+1F1F8+1F1FA 🇸🇺. use Emojitwo or Emoji Two instead of Emojione or Emoji One where appropriate. Some details have been removed, e.g. water waves for some marine animals. Some minor color optimizations, e.g. for genders, restriction signs and peace sign. New graphic for Shark emoji: U+1F988 🦈. All programming libraries have been removed. Reusable meta data files will remain. Characters defined in the Unicode Standard 10.0 (June 2017) and later. Sequences documented in Unicode Emoji 4.0 (November 2016, UTR#51), e.g. gender variants. Characters extended in Unicode Emoji 5.0 (May 2017) and later (UTS#51), e.g. flags. Existing Unicode characters without the Emoji property, especially to match other vendors (like Microsoft and Samsung). Custom sequences and alternatives, especially those supported by other vendors. Emojitwo shall adopt a more restricted color palette. Actual changes will be subtle and barely noticable. This will affect flags. Check the current issues to be sure the bug has not already been reported. If you have written a patch for the bug submit a pull request including your patch. Include a brief description of the issue and how your patch will solve it. Unlike Emojione, Emojitwo very much welcomes additions and changes to the artwork! 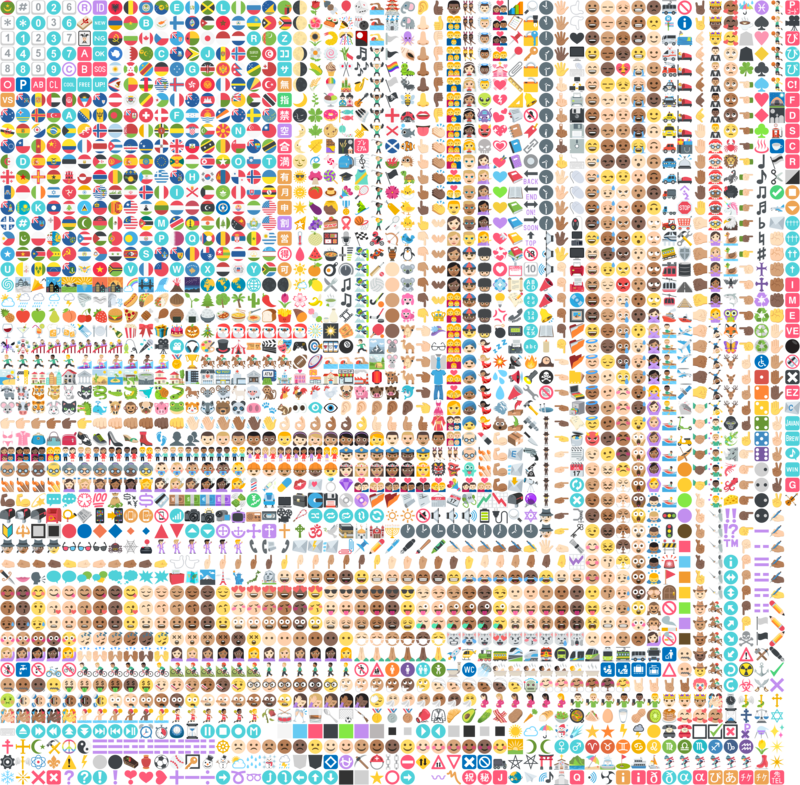 This is covered by the original and unrevokable CC-BY license chosen for Emojione 2.x artwork by Ranks.com. Design suggestions are welcome. They will be considered by the community. There is no guarantee they will be adopted. Notes on visual errors are also very much accepted, see Bugs. Both can be submitted as issues or pull requests at Github. Pull requests must contain the edited SVGs and may contain the respective PNGs generated from that. Keep in mind that although the main license is CC-BY 4.0, non-commercial and private use does not require attribution. When submitting artwork, you allow non-commercial and private use without attribution. Do not backport designs from Emojione 3+ or other sets with more restrictive or unknown licenses! Twemoji and Noto may have compatible licenses, but their design style is usually too different to be a good fit. We intend to provide graphics for all new emojis from upcoming releases of the Unicode Standard (i.e. codepoints) and of Unicode Emoji (sequences). Contributions are highly welcome! Pull requests should use the respective branch as a base, e.g. Unicode10, instead of master. We actively support the addition of graphics for new sequences even if they are not supported by any other vendor. Most existing SVG files are minified. This will change. New contributions should indent code to make it more readable. We support manual editing of SVG source code and therefore prefer semantic elements like <ellipse> and <rect> over more concise path notation. For legacy reasons, we currently prefer SVG attributes over CSS styles, e.g. fill="#F00BA7" instead of style="fill: #F00BA7". This may change in the future. Contributions should reuse colors already used within the project. Documentation of the Emojitwo palette shall follow. All <g> elements should have a self-documenting id attribute, e.g. mouth instead of g12. Every file should be self-documenting with proper elements. We currently do not embed meta data like Dublin Core, but this may change. Applies to all PNG and SVG files as well as any adaptations made. With the release of version 3.0, the Emojione project also made changes to 2.2.7’s licensing. Previously, Emojione did not require attribution for non-commercial and personal use. Considering that the Emojione project only changed the documentation in that branch to mandate attribution in any case, Emojitwo forked a state before those changes for greater flexibility. For non-commercial and personal use, you should credit the creators. For commercial use, proper attribution must be given on every web page, app, or video description where our emojis are displayed. The original name Emojione (or Emoji One or EmojiOne) and the forked name Emojitwo (or Emoji Two). Make sure it does not look like Ranks.com or the Emojitwo community created or endorsed your product. A reference to Ranks.com as original creators of Emojione. A note with link in the app store description is required. A note with link on every web page where our emojis are displayed is required. A note with link in the video description is required. If you discover any bugs, feel free to create an issue on GitHub. We also welcome the open-source community to contribute to the project by forking it and issuing pull requests. We are trying to backport all applicable issues from the the two Emojione repositories linked to above. If you have any questions, comments or concerns you are welcome to contact the maintainers directly.